This thread provides construction information for the Dual Class-A II "DCAO-2" Line and Headphone Output Board. The DCAO2 is based on the original Dual Class-A concept of using a "common mode" signal drive and differential bias drive to control a BD139/BD140 NPN and PNP output pair. 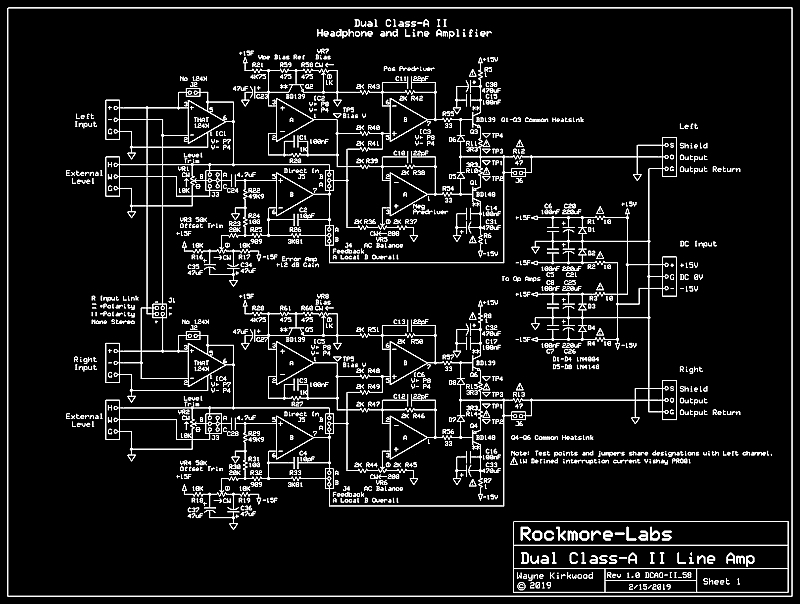 In the original Dual Class-A circuit, a THAT1646 or DRV134 line driver was used in an unconventional configuration where the Sense lines were driven by signal in "common mode" with a Vbe bias reference driving the "normal" differential input. The two outputs of the THAT1646 drive the current boost transistor bases. The NPN output is level-shifted up by the Vbe reference, the PNP output is "voltage-mirrored" down by the Vbe reference and both are driven together by signal. The DCAO2 Dual Class-A II Line and Headphone Amplifier improves on the original design to provide both voltage gain and optional global feedback. 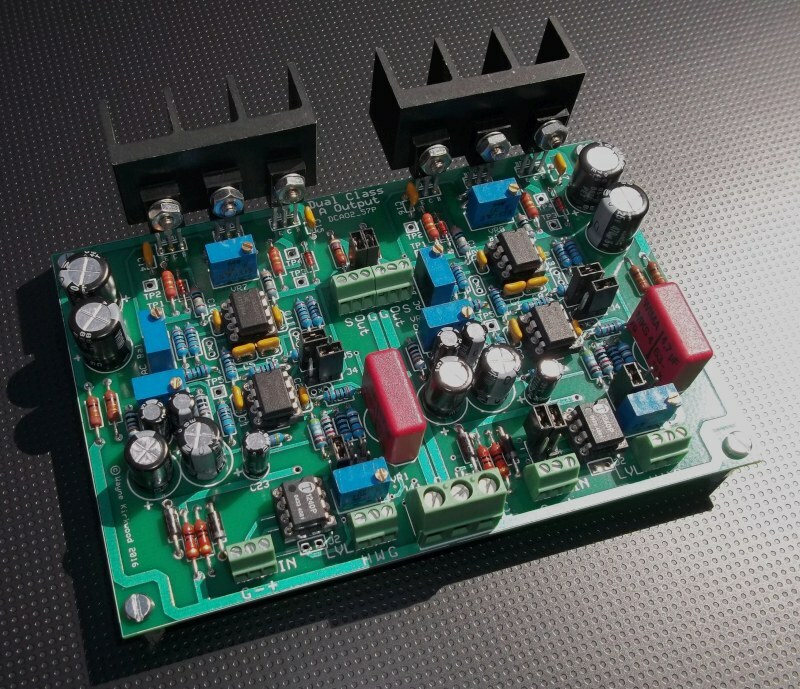 The DCAO2 output current booster is identical to the original DCAO but the DCAO2 pre-driver circuit has been changed to use op amps which emulate the THAT1646 concept of common mode signal and differential bias drive. Though the THAT1646 and DRV134 are excellent devices it was found that the even-order distortion of the driver stage could be reduced further by trimming. A gain stage has been added to the DCAO2 which permits optional closed loop operation. Global feedback extends the output capability of the DCAO-2 to several watts in Class A/B. At power levels below 100 mW, operation remains in Class-A. The advantage of having closed loop operation at lower power levels is a reduction in output impedance. The high linearity of the DCAO2 output running at 85-100 mA does not produce errors requiring corrective feedback at power levels below 100 mW. The benefit of feedback is reduced output impedance. The open loop output impedance of the DCAO and DCAO2 is just under 2 Ohms. Running closed loop the DCAO2 closed loop output impedance is reduced to about 40 mΩ. With the DCAO2 the user can drive headphones with "0 Ohm" (40 mΩ) Rout, less than 2Ω (open loop) or with any Ro of their choosing. A circuit description will soon follow. I wanted to post a picture of a Dual Class-A II board being assembled for those who are just now receiving them. 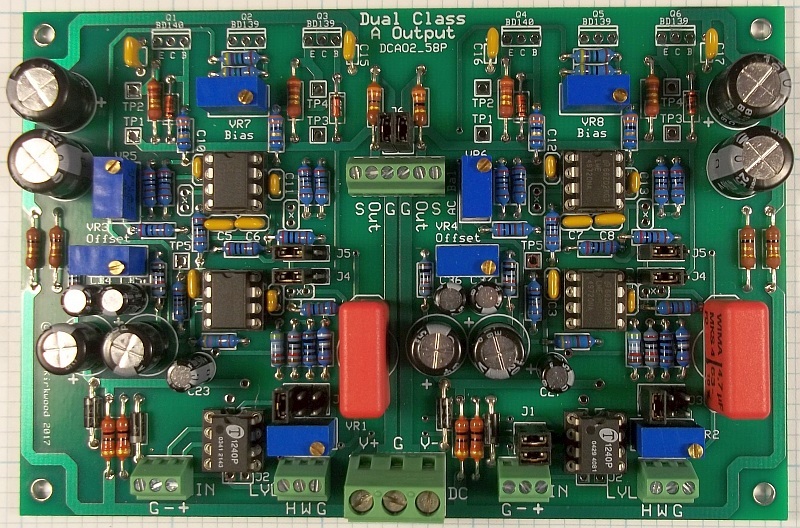 This particular board is fully-assembled with the exception of the output transistors and has undergone initial DC tests. The links are in the test position. I'll be including this and other pictures in the pdf assembly instructions so you may want to check back and re-download them. Assembled Dual Class-A II Board before installing the output transistors. This particular board is being assembled for headphones so the optional output build-out resistors are 33Ω. I ship them with 0R build-out with J6 shunting the 33Ω. Since the HPA will likely be used in a consumer environment the balanced inputs use THAT1240s. "+4" builds should use THAT1246. The LME49720 is the best all-around performer in this circuit. The OPA1612 or FET OPA1642 on a DIP adapter is top-notch. OPA2134, OPA260s and even the 2114 or 5532 do well. Update 2/8/2019: The schematic improperly reverses J4 and J5. J4 is the feedback jumper. An updated schematic will be posted soon.